We are delighted to announce that we have special guests joining us for the Christmas concert on Friday 18th December at St Margaret’s Church, Swinton. Unite the Union Brass Band is one of the most successful bands in Sheffield and South Yorkshire; currently contesting in the 1st section. Bel Canto met Unite the Union Brass Band while performing at Sheffield City Hall last year with Lesley Garrett and are thrilled to be working together again. 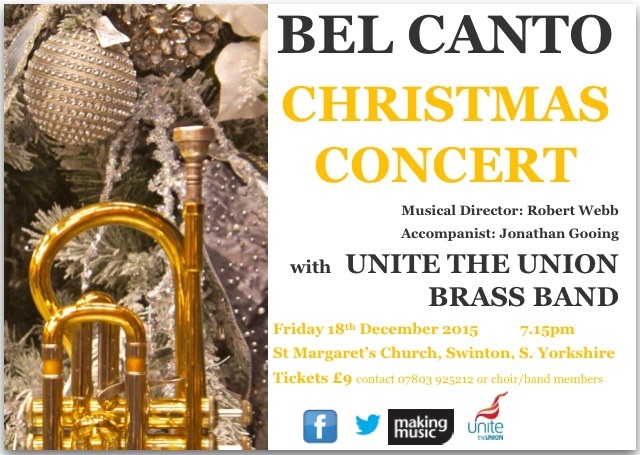 An evening of the very best of Christmas music is guaranteed – make sure you book early. Tickets are on sale now £9 from choir members or text 07803925212.